Fathers, children and Night Terrors (2011). | Randomwhoness: a Doctor Who blog by Johnny Spandrell. Sampling stories in random order. Fathers, children and Night Terrors (2011). It’s time, as I’ve threatened previously, to talk about kids. The little Daleks are everywhere these days. And it’s since Steven Moffat took over as show runner. By my reckoning 42% of stories he’s EPed have featured children in major roles. By comparison, Russell T Davies era had 23% of stories with prominent roles for kids, and three of them were written by Moffat. It makes sense to include kids in the show as audience identification figures, and we often see them in familiar locations; bedrooms, school rooms, playgrounds. Night Terrors centres on a child’s bedroom, the place to where, one imagines, a child may retreat after watching Doctor Who and relive that episode’s scares. Long shadows and creaky doors amplifying the heebie jeebies. Kids have parents more often than not in modern day Who, so parenthood gets examined regularly. We’ve met parents of all the recent companions and the Ponds became parents during their tenure. Mothers and fathers abound, and particularly in the Matt Smith era, we meet a lot of fathers. And there’s a clutch of stories in Series 6, where we seem to be meeting fathers every week. Night Terrors is one of them, but think of A Christmas Carol, The Curse of the Black Spot, The Rebel Flesh/The Almost People and Closing Time. Add to this A Good Man Goes to War and Let’s Kill Hitler in which we see Rory as a Dad, and it’s clear that fatherhood is on the mind. So here’s a few things we learn about fathers from Moffat’s Who. They’re a bit hopeless. A la Alex in Night Terrors and Craig in Closing Time. Fatherhood bewilders them. They get a bit overwhelmed, poor dears. They can be terrible role models. If your Dad is Elliot Sardick or Henry Avery in particular. They will come looking for you. Right across the universe in Rory’s case. They love their kids, even if they aren’t the biological father. Ask Ganger Jimmy, or Alex who finds out his kid’s an alien. The power of their love can solve everything. It can convince you to destroy your make believe world and blow the heads off Cybermen. Generally, they have sons, not daughters. Except Rory. Stories about kids and parenthood never happened in old Who. That’s right never. Well, hardly ever. Occasionally a father got murdered and their daughter became a companion. And actually, kids were rarely present in old Who. How many pre teenage kids with speaking roles in old Who can you name? There’s the boy in The Reign of Terror, the girl in Castrovalva, Squeak in Survival…. Um that’s about it. 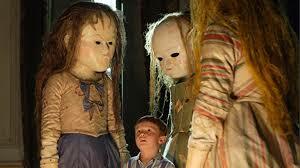 And they certainly aren’t pivotal roles, like young George (a charming performance from Jamie Oram) in Night Terrors. So old and new Whos have made conscious and opposite decisions. One to exclude kids from its narrative and one to feature them heavily. Old Who‘s reasons may well have been practical. Was it just too hard/expensive to cast kids? Or was it that they were considered too great a risk? Children’s performances being unpredictable at best. Or perhaps it was just that there was no need; the producers found that it was perfectly possible to thrill, amuse and enthrall children without including a kid in the story. It’s that last possibility that make’s new Who’s fascination with kids all the more mysterious; the show doesn’t need them. Works perfectly well without an audience identification figure for the little ‘uns. So as I’m feeling a bit listicle this random, let’s see if we can list the advantages of including kids. They help explain their adult equivalents. Think River Song, Doctor Simeon and most recently in Listen, the Doctor. We understand them a bit better because we’ve seem them as kids. They ask a lot of questions. Which means you can give the companions a break from plot exposition. And there’s one other possibility. That the kids are there for audience identification, but not for children watching to identify with, but adults. They remind adult viewers what it was like to watch classic Doctor Who. This is particularly relevant to Night Terrors, and demonstrated by one scene in particular. Alex is in the front room, being hassled by creepy landlord Purcell (Andrew Tiernan) for the rent money, which Alex can’t pay because he’s out of work. Alex, being the hopeless Dad, is clearly terrified and to be fair Purcell has brought along a brutish looking dog. George meanwhile can hear all this from his bedroom. Luckily, the Doctor is there. With a swish of his sonic screwdriver, he brings all of George’s toys to life, as easily as if turning on a remote. George’s world is suddenly filled with fun and wonder, the troubles of the outside world forgotten. That’s the power of the Doctor, and its an experience which no doubt countless adult viewers can relate to. And that’s ultimately why kids are so often in new Who. To them, the Doctor is simple. He’s pure, unadulterated (great word, that), magical hero. And adults like remembering that feeling. They had it too before growing up. It all boils down to that really: nostalgia. ADVENTURES IN SUBTITLING: ‘He hates clowns’, says Alex and one stage. ‘He hates crayons’, say the subtitles. ‘Understandable’, says the Doctor. Not really. Later he says, ‘See these eyes? They’re old eyes.’ ‘They’re all lies’, insist the subtitles. LINK TO The Runaway Bride. Each begins with the TARDIS being unexpectedly infiltrated. NEXT TIME. I can’t wait for day 68. Until then there’s The Power of Three.